This is a very simple recipe of how to make a basic pasta dough for fresh pasta. Pasta in Italian is literally translated as dough. To us Brits, pasta is simply pasta, and that is it. Most Italians will break for 1 hour for lunch to eat a plate of pasta. It’s the heart and soul of Italian cooking, the building blocks of a nation. PLACE the flour on a board or in a bowl and make a well in the centre. CRACK the eggs into the well, add a pinch of salt then with a fork, mix the egg into the flour as much as possible so it’s not sticky. Don’t worry if there are lumps in the dough. Keep mixing and then when crumbs form put it on a flat surface and knead together. You can also speed this up by mixing your ingredients in a food processor until they bind. ONCE it is all combined, knead until you have a silky, smooth, elastic dough. You are aiming to achieve a playdough texture. If your dough is crumbly (too dry) add a teaspoon of olive oil. If the dough sticks to your hands (too wet) add a little extra flour. COVER with cling film and rest for 30 minutes. WHEN using a pasta roller, take a tennis ball-sized amount of dough, squash it flat with your fingers (remember to keep the rest of your dough covered with the cling film so it doesn’t go dry and crusty) push it through the pasta roller on the widest setting. Fold into thirds, then repeat 3 times. Once you have a rough square shape, start working it through the machine, taking it down one setting at a time, until the thinnest setting. If your pasta is too sticky, it won’t go through smoothly, so add a little flour to each side before you put it through the roller. Try to avoid too much flour – the less you use, the better otherwise your pasta can start to feel heavy and claggy when cooked. YOU should end up with a long sheet of pasta about 8-10cm wide. Place this on a flat surface with flour underneath to stop it from sticking. This is the most versatile form as from this sheet you can create so many different shapes and dishes. See our individual recipes for suggestions on how to make linguine, tagliatelle, pappardelle, ravioli and tortelli etc. LINGUINE: Sprinkle a little flour over both sides of the pasta sheet and fold it into thirds (short edges together). using a sharp knife, cut into 3mm- wide strips, lengthways. When you unfold the pasta you will have long linguine. TAGLIATELLE: Sprinkle a little flour over both sides of the pasta sheet and fold it into thirds (short edges together). using a sharp knife, cut into 1cm- wide strips, lengthways. When you unfold the pasta you will have long tagliatelle. PAPPARDELLE: Sprinkle a little flour over both sides of the pasta sheet and fold it into thirds (short edges together). Trim the long edges straight with a sharp knife, and cut into 2.5cm-wide strips, lengthways. When you unfold the pasta you will have long pappardelle. FARFALLE: Place your sheet of pasta on a floured surface. Use a pasta cutting wheel or sharp knife to cut your pasta into strips roughly 3-4 cm wide then cut across to create little rectangles. Take each rectangle and with lightly floured fingers, pinch in the middle to create your butterfly shaped pasta. If your pasta is too dry, wet your fingertips with some water. Lightly dust a few trays with polenta or semolina to prevent the farfalle from sticking together. Place the farfalle onto the trays and repeat the process until you have used all the remaining dough. Leave to dry for 20 minutes so they hold their shape when cooking. YOU can also roll your dough by hand using a rolling pin but you’ll need some serious elbow grease to get your pasta sheets really thin (about 1 playing card thick). DOUGH can be stored in the fridge overnight if you don’t want to cut it immediately, however any longer and you risk the dough turning black. ONCE you’ve cut your pasta shapes, if you make more pasta than you want to use (I like to cook 100g of pasta per person), leave it to air dry for 2-3 days and once completely dry it will keep in a bag or jar for several months. QUANTITIES: 100g of flour makes approximately 150g dough – enough for 1-2 people. 400g flour makes approximately 600g dough – enough for 4-6 people. 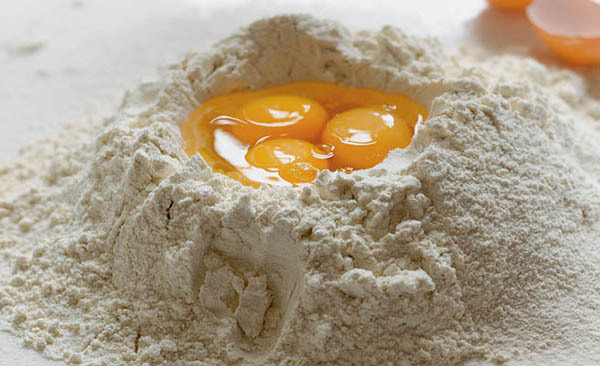 Add one egg per 100g flour and scale up or down depending on the number of people you are serving. THE CUP: Find a cup that is equivalent to 100g flour when full. Keep this to avoid having to weigh your flour each time. THE DOUGH: This recipe is easy and basic and doesn’t change. What does change is the quality of the flour, the size of eggs and the humidity in the air (think of how your hair reacts differently when you wash it if it’s a sunny day or wet day). Don’t panic; what is important is to know what consistency you are trying to achieve, then you can adjust things accordingly. Hold back the last egg if you are using more than 100g of flour. Check the consistency, then add the final egg slowly yolk first, then the white – if you need it. This should help make sure the dough isn’t too wet. If it is too wet (sticking to your hands) add a little flour until it binds. If the dough is too dry (i.e. completely falling apart and not binding) add a teaspoon of olive oil. But only do this if it is absolutely necessary. Remember it’s ok for the dough to look a little dry and crumbly after you’ve done the kneading. If you leave it to rest it will improve. You should be able to easily mop up all the remaining flour on the surface with your ball of dough. NOT TOO MUCH FLOUR: Don’t be tempted to add too much flour – the more flour you add, the heavier the pasta will be. When flour is added to water it basically turns to glue, so if you add too much flour to the mix, your pasta will become claggy and heavy. This is why, you should always place pasta shapes on a tray with polenta or semolina rather than flour, as it disperses when the pasta is put in the water. TYPE OF FLOUR: You really should use type ‘00’ flour when making fresh pasta as it makes the world of difference to the texture. You don’t want to make your life difficult, so invest in your flour. TYPE OF EGGS: Again you can use any medium sized eggs but the better the quality, the better the dough. In Italy they buy eggs with a large and very yellow yolk which gives the dough and pasta a vibrant yellow colour – try corn fed for the same effect. CLING FILM: Always keep the dough under cling film or a plastic bag once formed – otherwise it risks going hard and forming a crust. RESTING: If you are in a hurry, then it is not essential to rest the dough, but if you do have time, a 15 or 30 minute rest will really help your pasta have the elasticity it needs to stretch. PREPARING YOUR SHAPES: Once you’ve cut your pasta shapes, place them on a tray which has a dusting of polenta (as mentioned above). Space them out so that they air-dried a little and don’t stick together. Alternatively, if making long strips of pasta, you can hang them on a clean coat hanger or clothes horse. STORING EXTRA PASTA: Once you have cut your pasta shapes, if you make more pasta than you want to use, leave it to air dry for 2-3 days and once completely dry it will keep in a bag or jar for several months. WASHING UP: You might call us crazy but don’t wipe your surfaces with a dish cloth if they have lots of flour on them. Remember flour + water = glue. Our mum used to go mad if we wiped up a load of flour with her new clean dish cloths. Instead, we use anything with a firm flat edge (plastic scraper, back edge of a blunt knife) to get the excess flour off and then wipe the remains with kitchen towel.